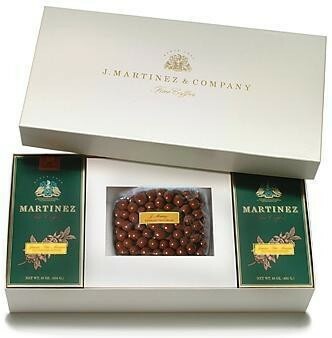 The J. Martinez & Company presentation gift box makes an elegant and generous gift. Filled with coffee and chocolates it is a selection that pleases almost everyone. Add this gift box to your shopping cart, including whether you desire milk or dark chocolate covered coffee beans and then choose any two pounds of our fine premium 'estate', specialty, or blended coffees to be included. The coffee can be any two pounds from any category of the "Coffees" menu. The price of the coffee is not included and must be selected separately. The cost of the box does include the cost of the chocolate covered coffee beans. If you are in a hurry, choose one of the three preselected gift options and we will select the coffee for you. In the summer months we will accept only overnight orders of chocolate. Please call to place your order. The J. Martinez & Company presentation gift selection is an elegant and generous alternative to the standard gift basket. Simply choose whether you want milk or dark chocolate and add two 1 pound coffees to your shopping cart. The price of the coffee can be any two pounds from any category of the "Coffees" menu.The coffee is not included with the box and must be selected separately, either by choosing one of the preselected coffee options above or by adding two pounds of the coffee of your choice to your cart. The cost of the box does include the cost of the chocolate covered coffee beans.